This is how my battlegrounds started today. Dueled Arandir, and got owned badly. So we grouped up, grabbed a Mage that was dueling with us, and hit the random queue button. Came up with WSG. Arandir dominated the flag caps, leaving me to look really good with top damage. So good, that #2 wasn’t even at HALF of mine! 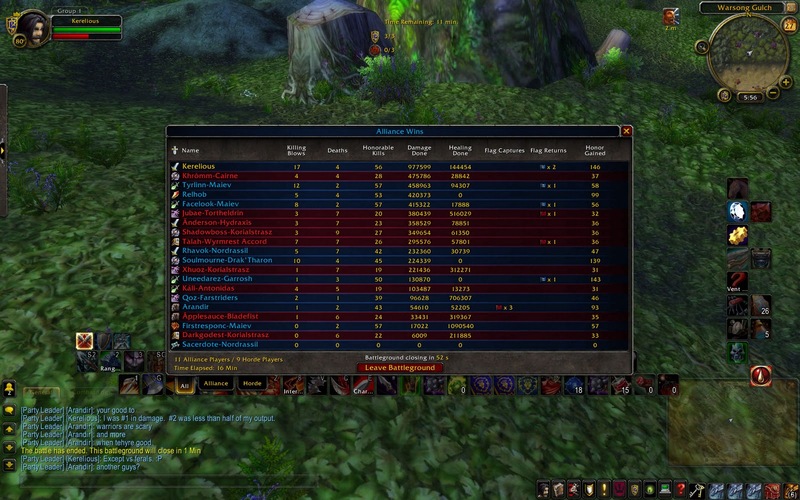 Did several other BGs today too and haven’t lost yet. This new battlegroup is looking nice. Though I heard they’ve only mixed two so far, not all of them yet. Clean up on isle 3! Next story Perfection in Strand of the Ancients!